The Ring (often called The Ring magazine) is an American boxing magazine that was first published in 1922 as a boxing and wrestling magazine. As the sporting legitimacy of professional wrestling came more into question, The Ring shifted to becoming exclusively a boxing oriented publication. The magazine is currently owned by Oscar De La Hoya's Golden Boy Enterprises, which acquired it in 2007. Ring publishes boxers annual ratings since 1924. The Ring, founded and published by future International Boxing Hall of Fame member Nat Fleischer, has perpetrated boxing scandals, helped make unknown fighters famous worldwide, and covered boxing's biggest events of all time. Dan Daniel was a co-founder and prolific contributor to The Ring through most of its history. It refers to itself (and is referred to by others) as "The Bible of Boxing." During the Fleischer years, the contents page or indicia of every issue carried the claim: "The Ring is a magazine which a man may take home with him. He may leave it on his library table safe in the knowledge that it does not contain one line of matter either in the text or the advertisements which would be offensive. The publisher of The Ring guards this reputation of his magazine jealously. It is entertaining and it is clean." In 1972, following Fleischer's death, managing editor Nat Loubet, his son-in-law, took over as publisher, launching, in 1977, three international editions of the magazine. The Spanish version, Ring En Español, was published in Venezuela and distributed to all Spanish-speaking countries and the United States until 1985. There was also a Japanese version published in Tokyo, and a French version published in Paris. In 1979, the magazine was purchased from Loubet by flamboyant publisher Bert Randolph Sugar, who hired future New York boxing commissioner Randy Gordon as editor-in-chief. By 1985, both Sugar and Gordon had moved on, then watched from the sidelines as The Ring neared bankruptcy in 1989, causing the magazine to cease publication for most of the year, until rebounding under new ownership and management in 1990. 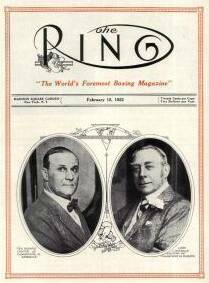 The Ring magazine was saved from ruin in 1990 by Boxing Hall of Fame Publisher Stanley Weston who founded Boxing Illustrated, KO & World Boxing and GC London Publishing Corp. Weston was a sentimentalist and 52 years after joining The Ring magazine as a stock boy, Weston purchased the magazine that gave him his first job. He not only resurrected the magazine from its imminent collapse, he re-established the publication as the definitive source for boxing news. An outstanding boxing artist, Weston painted 57 covers for The Ring with his first cover, a painting of Billy Conn, for the December 1939 issue. Weston was also a photographer who, according to his own estimate, shot over 100,000 boxing photos‍—‌the majority of which are housed in the archives of The Ring magazine. Some of the boxers featured on the magazine covers have included Tommy Ryan, Salvador Sánchez, Jack Dempsey, Pancho Villa, Max Schmeling, Joe Louis, Sugar Ray Robinson, Jake LaMotta, Rocky Marciano, Willie Pep, Muhammad Ali, Alexis Argüello, Wilfred Benítez, Wilfredo Gómez, Roberto Durán, Larry Holmes, Marvin Hagler, Sugar Ray Leonard, Bud Taylor, Mike Tyson, Evander Holyfield, Floyd Mayweather Jr., Thomas Hearns, Roy Jones Jr., Bernard Hopkins, Julio César Chávez, Félix Trinidad, Manny Pacquiao, Oscar De La Hoya, Mauro Mina, and Ricardo Mayorga. In 1977, boxer Cathy "Cat" Davis became the first female ever to be on a cover of The Ring, holding the distinction of being the only woman featured on the cover of the magazine until January 2016, when Ronda Rousey joined her and also became the first Mixed Martial Arts fighter featured on Ring's cover. The Ring has used cover artwork created by famed artists such as LeRoy Neiman and Richard T. Slone. The Ring was formerly published by London Publications and Kappa Publishing Group, which also published sister magazines KO Magazine and World Boxing, which were former competitors of The Ring but ceased operations while under Kappa's ownership. The Ring magazine was formerly led by International Boxing Hall of Famer Nigel Collins. Sports and Entertainment Publications, LLC, owns The Ring, which it acquired from Kappa Publishing Group in 2006. Sports and Entertainment Publications, LLC is owned by a group of private investors led by Oscar de la Hoya. Also acquired were KO Magazine and World Boxing. The magazine's rankings are recognized as "official" by some in the U.S. media, particularly ESPN. While some may see a conflict of interest in a boxing promoter being paymaster of what is essentially a magazine/rankings organization that awards world titles and belts, De La Hoya says that is not the case. "These magazines will be held in an editorial trust where they will be operating totally independent of any influence from me or others from the Golden Boy Companies as it relates to editorial direction or content". Also there is a 35-member ratings advisory panel, which include many of the media that cover boxing, who would prevent Golden Boy Promotions from using the magazine for self gain. The Ring was headquartered in Blue Bell, Pennsylvania until 2011 when it was relocated to Los Angeles. The magazine had a sister publication named The Ring Wrestling which came about due to professional wrestling writer Bob Leonard contacting the magazine and expressing that it was too focused on boxing and not giving wrestling enough coverage. Nat Loubet served as the editor of the wrestling magazine as well. The Ring has its own championship belt in a given weight class where The Ring champion holds a linear reign to the throne, the man who beat the man. The Ring began awarding championship belts in 1922. The first Ring world title belt was awarded to heavyweight champion Jack Dempsey and the second was awarded to flyweight champion Pancho Villa. The Ring stopped giving belts to world champions in the 1990s, then reintroduced their title in 2002, and ignored the current ongoing world championship lineage. The Ring first awarded Roy Jones their light-heavyweight championship belt in 2002 despite Dariusz Michalczewski being regarded as Lineal champion in the same weight class. The Ring then attempted to clear up the confusion regarding world champions by creating a championship policy. It echoed many critics' arguments that the sanctioning bodies in charge of boxing championships had undermined the sport by pitting undeserving contenders against undeserving "champions", and forcing the boxing public to see mismatches for so-called "world championships". The Ring attempts to be more authoritative and open than the sanctioning bodies' rankings, with a page devoted to full explanations for ranking changes. A fighter pays no sanctioning fees to defend or fight for the title at stake, contrary to practices of the sanctioning bodies. Under the original version of the policy, there were only two ways that a boxer can win The Ring's title: defeat the reigning champion; or win a box-off between the magazine's number-one and number-two rated contenders (or, sometimes, number-one and number-three rated). A vacant Ring championship was filled when the number-one contender in a weight-division battles the number-two contender or the number-three contender (in cases where The Ring determined that the number-two and number-three contenders were close in abilities and records). A fighter could not be stripped of the title unless he lost, decided to move to another weight division, or retired. In May 2012, citing the number of vacancies in various weight classes as primary motivation, The Ring unveiled a new championship policy. Under the new policy, The Ring title can be awarded when the No. 1 and No. 2 fighters face one another or when the Nos. 1 and 2 contenders choose not to fight one another and either of them fights No. 3, No. 4 or No. 5, the winner may be awarded The Ring belt. In addition, there are now six ways for a fighter to lose his title: lose a fight in his championship weight class; move to another weight class; not schedule a fight in any weight class for 18 months; not schedule a fight in his championship weight class for 18 months, even if fighting at another weight class; not scheduling a fight with a top 5 contender in any weight class for two years; or retiring. Many media outlets and members are extremely critical of the new championship policy and state that if this new policy is followed The Ring title will lose the credibility it once held. The purchase of The Ring magazine by Golden Boy Promotions in 2007, the dismissal of editor-in-chief Nigel Collins and several editorial staff in 2011, and a series of questionable ratings decisions by the new editors prompted many members of Ring Ratings Advisory Panel to resign. This led to the formation of the Transnational Boxing Rankings Board in 2012 headed by boxing historians Springs Toledo, Cliff Rold and Tim Starks. As of April 20, 2019. In 1976, unscrupulous managing editor of The Ring, Johnny Ort, fabricated records of selected boxers, to elevate them, thereby securing them lucrative fights on the American ABC television network, as part of the United States Championship Tournament, orchestrated by promoter Don King to capitalize on the patriotism surrounding the United States Bicentennial and the American amateur success at the 1976 Montreal Olympic Games. King's idea was to defeat the non-American boxers who held the vast majority of world titles below the Heavyweight division. Keeping in line with the patriotic theme of the promotion, King held shows at "patriotic" locales—such as the United States Naval Academy in Annapolis, Maryland, as well as on an aircraft carrier stationed off Pensacola, Florida. Despite the above, the 1977 Ring Record Book contained the fictitious additions to the records of the boxers in question, and were never taken out of their records of the boxers. Those dubious bouts would continue to appear in subsequent Ring Record Book editions. The Ring Record magazine scandal was uncovered by boxing writer Malcolm "Flash" Gordon and ABC staffer Alex Wallau. After Gordon and Wallau's evidence was presented to ABC executives the United States Championship tournament was cancelled. It led to the eventual resignation of New York State Boxing Commissioner James Farley Jr., who had lent his name to the Championship fights and who was the son of former New York State Athletic Commissioner and former Postmaster General James Aloysius Farley, who had died one year prior to the scandal. Farley Jr., had accepted a hotel room which had been furnished by King. This was used to smear Farley Jr., forcing his eventual resignation. No formal charges of impropriety were ever filed against Farley Jr. The following year the Boxing Writers Association dedicated their highest honor, the "James A. Farley Award", after Farley Sr., for honesty and integrity in the sport of boxing. ^ Ivan G. Goldman (January 2012). "The Ring is Counted Out". Columbia Journalism Review. Retrieved March 20, 2016. ^ Sports Illustrated, August 6, 1962. ^ Gordon, Randy "REMEMBERING THE ROCK & MR. BOXING", 'The Sweet Science", SEPT 6, 2014. Retrieved July 15, 2018. ^ Rousey becomes first MMA fighter to land Ring Magazine cover Fox Sports. Retrieved March 20, 2016. ^ "Riddick Bowe and Ray". ESPN.com. Retrieved January 3, 2016. ^ "Golden Boy Promotions". Golden Boy Promotions. Archived from the original on October 24, 2007. Retrieved January 3, 2016. ^ Tim Starks (September 9, 2011). "The Ring Magazine Shakes Up Its Leadership". The Queensberry Rules. Retrieved March 20, 2016. ^ "The Ring updates championship policy". Ring TV. May 3, 2012. ^ "Chat with Dan Rafael". ESPN. Retrieved January 3, 2016. ^ "The Horrible New Ring Magazine Championship Policy". Queensberry Rules. ^ "Ring Magazine's pretend rankings upgrade 'championship' policy". The Boxing Tribune. Retrieved January 3, 2016. ^ Cliff Rold. ""The Ring" Changes The Rules, Further Clouds Title Scene". Boxing Scene. ^ Gibson, Paul (February 2, 2015). "Boxing loses credibility with every new champion. Can the sport be saved?". The Guardian. ^ "The Transnational Boxing Rankings Board: An Opening Bell For Reform". The Queensberry Rules. Retrieved January 3, 2017. ^ "A King-Size Scandal in The Ring". Time. May 2, 1977. Retrieved May 25, 2010. ^ Newfield, Jack Only in America: The Life and Crimes of Don King, Harbor Electronic Publishing, New York, 2003, page 115. Retrieved June 16, 2018. ^ "Sport: "A King-Size Scandal in The Ring"". Time. May 2, 1977. Retrieved May 25, 2010. ^ "Past winners of The Ring's year-end awards". The Ring. February 24, 2012. Archived from the original on January 29, 2013. Retrieved March 11, 2012.